Look closely at this guy. What do you see? If you lean in and squint your eyes just right, it looks like a Mickey Mouse with a Pinnochio Nose. Ha! I think he’s cute, though. 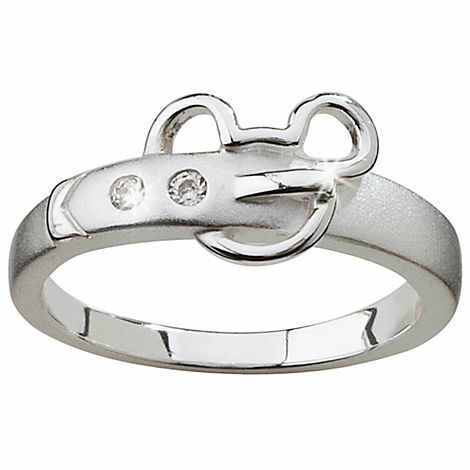 It’s a Sterling Silver Mickey Buckle Ring with a little Cubic Zirconium bling-a-bling-bling on the side. Whatcha think? Feelin’ the Mickey Buckle Pinnochi-nose Love? Click here to try it on for size! Love this! and the price tag is pretty fantastic too. Isn’t THAT the truth? Pretty reasonable for sterling, in my humble, blog-escent opinion! This is pretty classy, and would go with just about any outfit. I think I need one. I think it’s pretty nifty, too. Dress up. Dress down. However you’re feelin’ it!